In our latest addition to the Walled Garden you can visit a variety of Exotic Asian and African birds, from Vietnam and China to small islands in the Philippines. This unusual bird is the smallest hornbill from the Philippines. The Mindanao bleeding-heart, also known as Bartlett's bleeding heart dove, is a species of bird in the pigeon family and is originally from the Philippines. These male of these birds are very eye-catching with highly iridescent electric blue-violet, metallic green-turquoise feathers. The Socorro dove is a medium-sized dove which mainly lives and moves on the ground. The dove is a cinnamon colour, with a blue-grey back and pinkish neck. It is sadly now an extinct species in the wild, making it one of the rarest species held at Wild Place Project. In the wild, this small bird is found in small, fragmented areas of China with an extremely small known population. The Luzon bleeding-heart is named for the red spot on its breast, which resembles a bleeding wound. It is originally from the Phillippines. 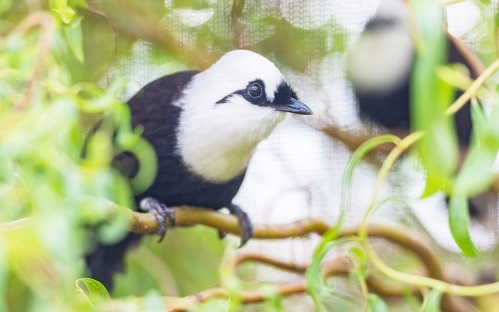 This bird is from Indonesia but is unfortauntely under threat from habitat loss and capture for the pet trade. Like the pheasants found in the English countryside, the male of the Edward's pheasant is more brightly coloured than the drab colours of the female. This bird is found in the rainforests of Vietnam when in the wild. Like The Fischer's turaco features a green body with a Mohawk on the top of the head. Around the eyes is a circle of red, with distinctive white feathers on the face. This bird is mainly found in the tropical moist lowland forests on the East coast of Africa.